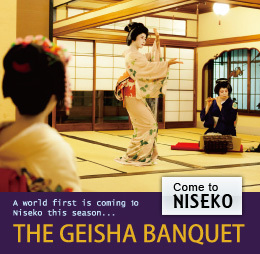 I would like to book a dinner with geisha in a beautiful traditional Japanese setting. I understand that this space may be shared with other guests. There is no supplementary geisha booking fee for this option: just the price per person, as listed below. For 15,000 yen per person, you will be served a traditional Japanese meal and nomihoudai (all-you-can-drink alcoholic/non-alcoholic beverages). For a minimum of 6 people, transportation to and from the Seicomart in Hirafu will be provided free of charge. Please inquire for further information on location and transportation options.